Happy Monday! Blech, eh? Pfft. Work days. Anyhoo, I had a busy weekend. 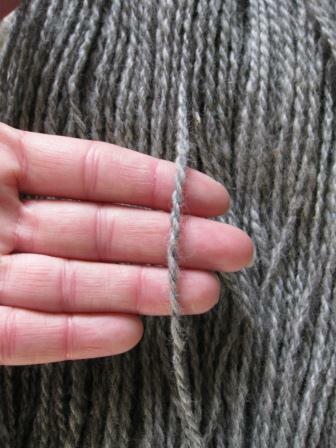 In addition to doing battle with an overgrown forsythia bush, I spun about 300 yards of this medium weight grey yarn. This is Loredo’s fiber. He isn’t one of our alpacas; his fleece was given to us by a friend. 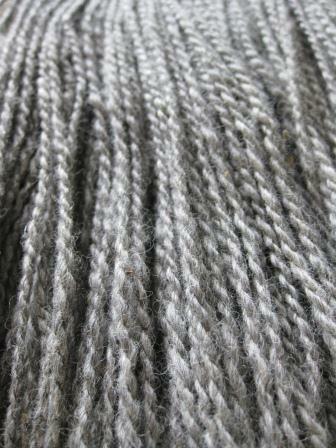 I think I’ll probably only get these two skeins, plus that busy black and grey marled yarn, out of the whole fleece. But it is very soft. Perhaps you can tell that this yarn is less even than my usual work. Well, perhaps you can’t, but I can. Loredo’s roving had quite a few tangles and questionable spots. I think the milling process tends to be pretty hard on the finer fibers, and that shows in the final product. For the sake of my sanity, I just let it spin up the way it wanted to be: somewhat lumpy and uneven. We call that “novelty yarn” people. I found a few more ridiculous pictures of the alpacas from shearing, so those are on the docket for tomorrow and later this week! This entry was posted in fiber art and tagged art yarn, handspinning, handspun yarn, novelty yarn, spinning, yarn. Bookmark the permalink.